The Book of Revelation, or simply Revelation, is the final book of the Christian Bible (The New Testament). Traditionally the authorship has been ascribed John, an Apostle of Christ, while John was imprisoned on the island of Patmos, notwithstanding "modern scholarship" which claims that nothing can be determined about the author other than that he was a Christian prophet or some putative figure called "John of Patmos". It records a series of visions dealing with the End Times; Jesus Christ Himself provided the visions to John. Due to its prophetic nature Revelation is considered a difficult book to understand (though its imagery has made it a popular one). It has also given rise to a cottage industry of sorts with the almost endless number of books attempting to interpret the prophecies in light of modern-day political events (along with conferences and seminars to sell those books). The Book of Revelation was one of the last books to be fully accepted into the New Testament Canon largely due to its difficulty in being understood. To this day the Eastern Orthodox church does not include it in its Divine Liturgy (though it is included in Roman Catholic and Protestant ones). Martin Luther did not consider it to be apostolic or prophetic in 1522 (though by 1530 he had largely changed his view); John Calvin did not write a commentary on it (the only Biblical book on which he did not). Chapter 1 is John's introduction to the book. John explains that he was exiled to Patmos for preaching the Gospel. While in the Spirit on the Lord's Day (Sunday) Jesus Christ appears to him with a countenance bright as the son, walking in the midst of seven golden candlesticks holding seven stars, with a two-edged sword proceeding from His mouth. John is instructed to "[w]rite the things which thou hast seen, and the things which are, and the things which shall be hereafter" (verse 19) and send them to seven specified congregations located in Asia Minor (modern day Turkey): the congregations at Ephesus, Smyrna, Pergamum, Thyatira, Sardis, Philadelphia, and Laodicea. Chapters 2 and 3 consist of seven letters, one each to the seven churches listed in Chapter 1. Four of the seven churches (Ephesus, Smyrna, Pergamum, and Thyatira) are commended for their actions but also warned that if they did not repent of certain deeds done, punishment would come upon them. The church at Philadelphia is commended only and not admonished; the churches at Sardis and Laodicea are not commended at all but only admonished (the wording for the Laodicean church differs from the others in that they are either told or warned of impending punishment—the KJV says that he "would spew them out of his mouth", while other translations state that it was a warning of future punishment—then told to repent). From Chapter 4 through the end of the book are shown the numerous prophetic visions for which Revelation is best known, even in the secular world. The events of the book are largely centered around two periods: a seven-year period widely known as The Tribulation (during which the judgments revealed will take place), followed immediately thereafter by a 1,000-year period widely known as The Millennial Reign (also sometimes called the "Millennium", which means "1,000 years") when Jesus Christ will reign as King over all the Earth. The events of the Tribulation are outlined in Chapters 4 through 18. However, it is commonly believed that Chapters 12-14 recount past events (such as the war in Heaven featuring Satan and his demons vs. Michael and his angels). There is wide disagreement among religious scholars as to the fate of Christians before the Tribulation period. Revelation itself does not discuss this topic. What is understood is that, at the outset of the Tribulation, a figure called the Antichrist (or the Beast) will rise on the scene. He will establish a one-world government to which all must pledge allegiance, in order to buy or sell, by taking on themselves a mark consisting of the Number of the Beast (also called the Mark of the Beast, and best known by its numerical designation of 666); however, those who take the mark consign themselves to ultimate eternal damnation. He is accompanied by a religious figure, the False Prophet, who will establish a one-world religion in direct opposition to Christianity, to which all must adhere. Though there will be those who resist (notably the Two Witnesses and a group of 144,000 evangelists, often believed to be Jewish), the Antichrist will largely be successful in opposing and killing those who resist him. The Antichrist will establish a peace treaty with Israel for seven years, allowing Israel to rebuild its long-awaited Temple and restore the Jewish sacrificial system. Once the Temple is completed at the mid-way point of the treaty, the Antichrist will reveal his true nature: he will enter the Temple and proclaim himself to be the awaited Messiah. At this point, the world will be subject to a series of ever-harsher judgments. Ultimately world events will lead to a final battle between the nations of the world (led by the Antichrist) and Israel culminating at the Battle of Armageddon. Israel will find itself on the brink of extinction when Jesus Christ Himself will return with an army (commonly believed to consist of all Christians from all of history) and defeat the Antichrist and False Prophet. During the Tribulation period a total of 21 judgments are pronounced on the earth, grouped into three series of seven judgments each. The first seven are announced by the breaking of Seals, the next seven announced by the blowing of Trumpets, and the final seven announced by the pouring out of Bowls. The first four seals are widely-known even in the secular world by their appearance as four horses and riders, commonly referred to as The Four Horsemen of the Apocalypse. Traditionally they are referred to as Pestilence, War, Famine, and Death; however, the Bible itself only directly names Death. 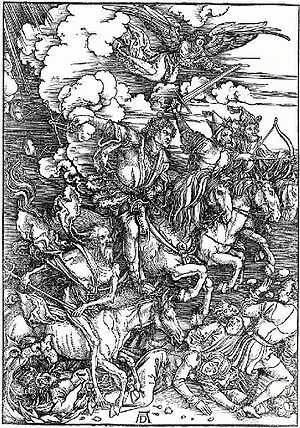 The first horseman is believed by some to refer to the Antichrist (as it appears early in Chapter 3), while other interpretations (common among those holding to Postmillenial views) equate it to worldwide Gospel preaching. Some scholars hold to a direct correlation between the events of the seals and the list of events found in the Olivet Discourse, as found in Matthew 24. According to this view, the first four seals are usually perceived as being the beginning of birth pangs (Matthew 24:4-8). The "concurrent" or "overlapping" interpretation postulates that the judgements overlap each other, with the Seal judgments being the longest in duration, the Trumpet judgments being shorter, and the Bowl judgments the shortest. The "consecutive" or "crescendo" interpretation teaches that the next set of judgments occur after the previous set of judgments, and increase in harshness between them. As such, the Seal judgments are followed by the Trumpet judgments and finally by the Bowl judgments. After the seventh Bowl judgment is pronounced on the Earth, Chapter 17 shows a vision of a harlot, riding on a scarlet-colored beast having seven heads, ten horns, and blasphemous names all over its body. Chapter 18 proclaims its destruction to the sorrow of the world's people. The Whore of Babylon has been the subject of great controversy as to its representation. Historically Protestants have claimed the chapters refer to the Roman Catholic Church. This interpretation is not as common in modern times due to ecumenical dialogue between Catholics and some Protestant groups, but is still prevalent, especially among fundamentalist branches of Protestantism. After the Tribulation period begins the events of the Millennial Reign, found from Chapter 19 through the end of the book. The period begins with a great feast known as the "Marriage Supper of the Lamb", where Jesus Christ is wed to his Bride. He then defeats the kings of the world, takes the Antichrist and the False Prophet and casts them alive into the Lake of Fire (commonly accepted to be Hell) while slaying the rest of the armies. Satan is captured, bound, and cast into a bottomless pit for 1,000 years. Only those who came through the Tribulation and did not receive the Mark of the Beast remain alive. After the 1,000 year period Satan is loosed for "a little season" (the duration of which is not specified in the text), whereupon he would deceive the nations in an attempt to overthrow God once and for all, only to see God Himself devour them. Satan is then cast into the Lake of Fire, to receive eternal torment. Then all persons who ever lived are raised one final time, the Books are opened (especially the Book of Life); those not found in the Book of Life are cast into the Lake of Fire. Death and Hades are also cast into the Lake of Fire, this is the Second Death. At this point time as we know it on Earth ceases. The last two chapters describe the holy city (New Jerusalem) wherein the saints will reside forever and ever. The book ends with a warning not to add to or take away from it (due to its placement at the end of the Bible, the verses are commonly interpreted to mean that people should not add or take away any portion of the entire Bible itself). The most common interpretation is that the letters were to the congregations directing them of certain actions needed (all seven cities historically existed and each was known to have a local congregation in it). Another interpretation posits that it is intended to describe different types of churches which exist (the Ephesus church being one doing a lot of good and commendable works but not doing them with a love for God, for example). The third interpretation is that each congregation represents various periods within the Church Age (in order from Ephesus to Laodicea, the latter being either the church just before or during the prophetic events described beginning in Chapter 4). The most common interpretation of this section is that the visions prophesy events to take place during the End Times. These views frequently attempt to interpret current geo-political events in light of the text. Those primarily of the Preterist view postulate that the writing describes a period of persecution in the early church either during the reign of Nero (54 - 68) or Domitian (81 - 96) and therefore the events have already taken place. Works and concepts based on Revelation include "666" as the number of the devil, the great writing by Dante in his Inferno, and Michaelangelo's Last Judgment in the Sistine Chapel. ↑ It's formal title, as shown in the King James Version, is The Revelation of St. John the Divine, but it is also called The Revelation to John, The Apocalypse of John, and is often misquoted as Revelations. ↑ In ancient writings as going back as early as Justin Martyr, it was held that the author of this book was John the Apostle. ↑ The three main views are the Pre-Tribulation Rapture (where Christians are taken out of the world beforehand; the Left Behind series is based on this view); the Mid-Tribulation Rapture (where Christians are taken out when the Antichrist reveals his true nature; this view is the least-held), and the view that there will not be any Rapture at all and Christians will go through the Tribulation (a variant on this view has all Christians going through the Tribulation, with those successfully going through the entire period being raptured immediately before the Battle of Armageddon). ↑ The Bride is commonly believed to be the Church, defined in this context as all those throughout history who became Christians. ↑ For example, the view that the European Union is a precursor to the forthcoming one-world government. This page was last modified on 30 December 2018, at 22:57. This page has been accessed 29,362 times.